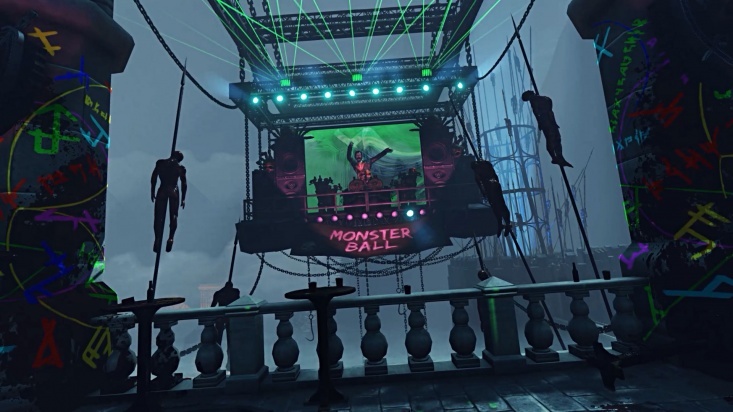 The Monster Ball is a Killing Floor 2 map. 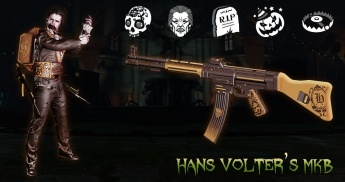 Is was added in the game as a part of Monster Masquerade update. 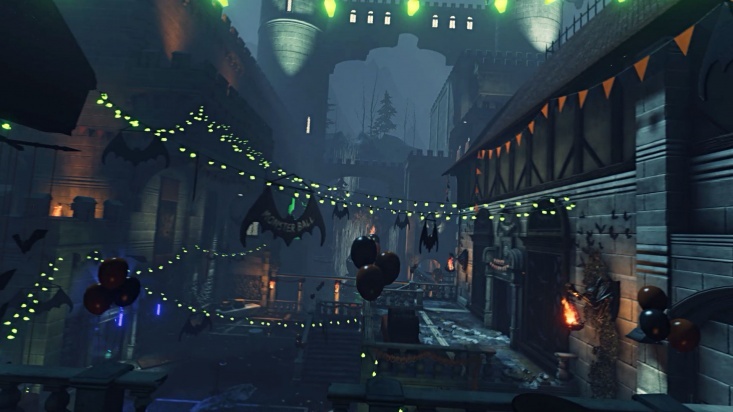 This halloween themed map that takes place in an old castle decorated and modernised to host a rave party, a lot of graffiti and modern art elements can be seen outside the main structure. On the balcony of left side of the map there is floating platform where Hans himself resides as a DJ. The right side of the map is a castle's indoors which is rather narrow area with a lot of corridors and obstacles scattered around them. Map is fully compatible with Survival, Versus and Endless gamemodes. 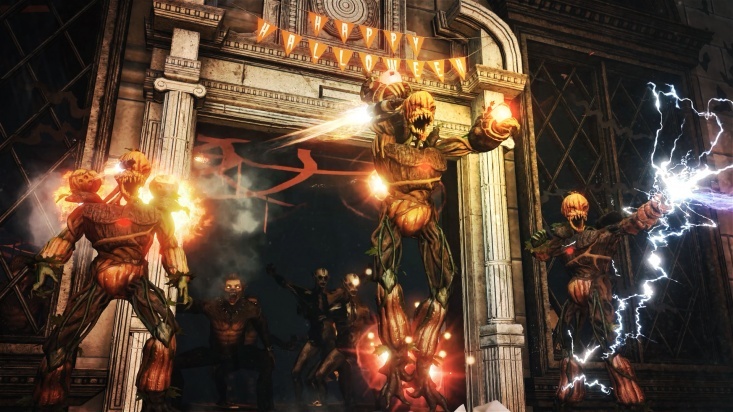 Upon completing a series of objectives on Monster Ball during the Halloween Event players will be rewarded with early access to Commando's Mkb.42(H) Carbine Rifle as well as to unique weapon skin for it. "Trick or Trap! ": Use traps to kill 25 Zeds in one game session. "Dead Men Tell No Tales": Bust 10 glowing skull collectibles. "Monster Mash": Kill 2500 Zeds. "Party All Night Long": Complete wave 25 on Endless Hard or higher difficulty. 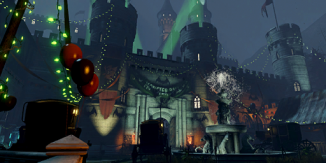 "Lord of the Castle": Defeat Count Hans on Survival Hard or higher difficulty. Monster Ball featuring plenty on traps to aid players in combat. Both Fire traps (one under the bridge with 4 archs under it, located on the left side of the map and the other located in the main structure emitted from the skull with Hans' portrait above it) do 30 points of "fire" damage to ZEDs (only) and at same time and place as well do 4 points of "fire damage' to both - ZEDs and players. Damage interval - 1 second. DOT: Damage scale = x1.5 of trap damage, Duration = 5s, interval = 1s, Burn power per hit / DOT tick = 15.5. ZEDs will NOT attempt to evade these traps. Trap lasts for about 7 seconds. Reactivation delay - 15 seconds. 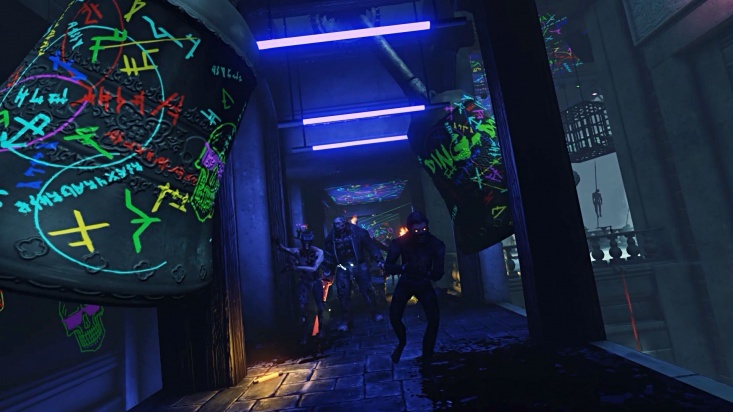 Two Bell traps (on the left side of the map, not far from where the DJ's stand is) do 10 points of damage and knock down ZEDs. The damage goes to the player's actual health. Traps lasts for about 9 seconds. Reactivation delay - 25 seconds. Bridge electric trap under the waterfall does 2 points of damage within 1 second intervals. EMP power per hit = 100, trap lasts for 17 seconds. Reactivation delay - 15 seconds. Movable Cage trap at the right end of the map lasts for about 10 second. Reactivation delay - 15 seconds. Floor trap next to the EMP trap lasts for 4.5 seconds and has reactivation delay of 20 seconds. Piercing trap under it does 3 points of "piercing" damage within 1 seconds intervals. This page was last edited on 11 November 2018, at 08:20.